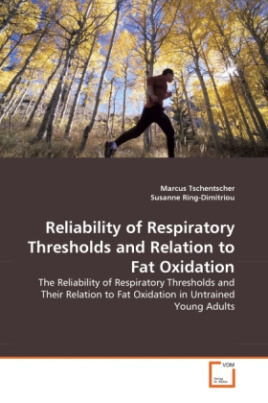 As there is a lack of investigating the relationship between respiratory thresholds (ventilatory threshold (VT), anaerobic threshold (AT) and respiratory compensation point (RCP)) and fat oxidation, this study aimed to determine: 1) the reliability of the different respiratory thresholds as VT, AT and RCP, and 2) the percentage of fat oxidation at VT, AT and RCP in untrained young subjects. Fifty two sedentary subjects volunteered in a ramp test-retest protocol with 1 minute increments to detect VO2peak on a treadmill until complete exhaustion. The way of measurement and calculation method indicated a very high correlation. Based on the results, RER and fat oxidation showed the dependence of fat metabolism to physical workload and amount of the respiratory thresholds. This is reflected in the significant difference between VT/AT and RCP. In untrained young subjects VT and AT occurred at about 50% VO2peak with a fat oxidation of 51% in women and 42-46% in men. RCP appeared at about 85% VO2peak leaving only 7% of fat oxidized in women as well as in men. With increasing workload fat oxidation declines while percentage of VO2peak increases as expected.